A century of experience and the cultural background the Accordini family carries with it, allows them to refer on a daily basis to these qualities in order to produce grapes native to Valpolicella. Corvina, Corvinone and Rondinella grow in the vineyards high up in the hills where the grapes find mainly limestone and skeletal soil. These conditions lower the yield, but improve the quality. The milder climate compared to the plains and the high temperature variation influences the ripening of the fruit, encouraging the accumulation of particular colorants and aromatic substances, above all spicy notes, which make these wines unique and unmistakable. This vineyard, planted by Stefano in 1975, contains grape varieties strictly local and grown in Verona pergolas. The soil which is deep with a high clay content has a good active layer and is under vines that are over 40 years old. These plants have stabilised over time creating a perfect vegetative-production balance, and the deep roots guarantee continuous sustenance even in the driest of periods. The combination of these factors make the grape production perfectly balanced in respect to the leaf area of the vines, a rare condition which exists only in the territories best known for wine production. The vineyard was a key element in the project of Tiziano and Daniele to move the wine production into the mountains. The land is clay-limestone and very resistant to arid periods. Thanks to the perfect exposition of the vines, the grapes offer interesting indices of ripening and the resulting wines have a particular accumulation of anthocyanins and aromatic substances of a spicy nature. This area includes the territory which surrounds and embraces the new winery. The altitude and the exposition create a unique microclimate in which the temperature never goes above 32 °C even at the hottest time of the year. These conditions make the ripening process of the grapes perfect and at harvest time they have a good acidic content, large quantities of anthocyanins and aromatic substances of a spicy nature. The vineyard, the highest in terms of altitude, is in the hills separating the valley of Fumane from that of Sant’ Ambrogio. The soil, rocky and poor, is a big challenge for the vines. However, thanks to the choice of the base plant 41B onto which the vines are grafted, which was chosen after a precise agronomic analysis, it is possible to guarantee an excellent vegetative-production balance. The grapes, following ripening, show a notable accumulation of sugars and aromatics whilst maintaining a good level of acidity. The Valpolicella Classico wine is produced right here, rich in the mineral flavours of this land. 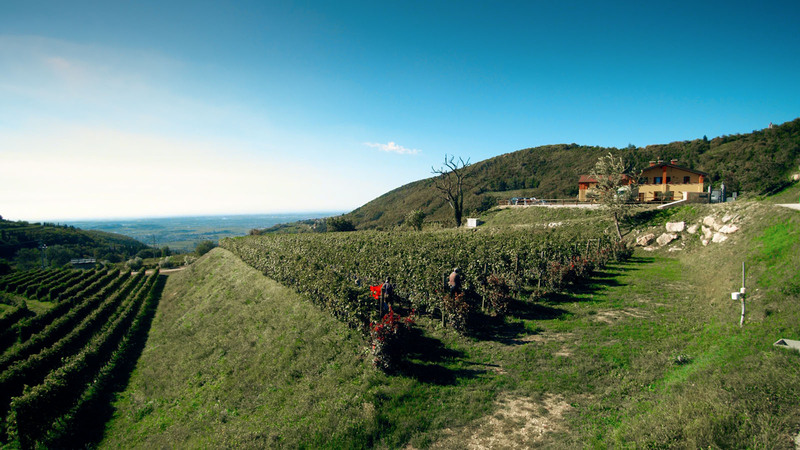 Located in the valley of Sant’ Ambrogio this vineyard enjoys the breeze coming from Lake Garda. In the summer months the mild temperatures create a unique and favourable microclimate that gives life to grapes of unarguable quality. The whole area is terraced with “marogne”, typical dry stone walls of local rural architecture. The soil which is prevalently limestone and the perfect exposition favours the growing of international grape varieties. The vineyards of La Cà are those found near the new agritourism B&B of the company. Rich in skeletal soil and interspersed with thin layers of clay, this area has a good active surface which makes it ideal for growing the native grape varieties of Valpolicella. The roots of the vines go deep into the ground and explore the depth of the earth, enriching the grapes with sugars and phenolic substances.